I’m typing this up on a gloomy day here in Zone 5, Canada. In the past week, I’ve experienced an impromptu snowstorm, a city-wide power outage, and then a bright sunny Saturday where the temps went up to 16 degrees Celcius. It’s been a wacky week. I had been excited to sow quick-growing cool-season crops outdoors on Sunday, but the weather decided it had other plans. It’s been rainy for a whole two days, and I’m not sure when it’s going to stop. I had to throw away my cracked and broken 10-year-old rainboots last year. I think it’s time to invest in another pair! I received another great question that I’d like to tackle this week. Can I use last years seeds? I bought a bunch of seeds at my hardware store for half off. Will there be any problems germinating? The short and sweet answer is yes! You can’t most definitely use last year’s seeds. Most seed packets feature a sell-by date that should give you an indication of how fresh (or not fresh) they are. The key to keeping seeds fresh and viable for years down the road is proper storage. An airtight container is the best home for leftover or saved seeds. I used to keep my seeds in mini petri dishes I purchased for cheap on eBay, but they were hard to open, and I often lost track of their original seed packets. I then started storing packets in an airtight container, but I didn’t like that there was no way to keep different varieties of seed separate. Then, I spotted a genius storage idea on a fellow gardener’s Instagram stories. 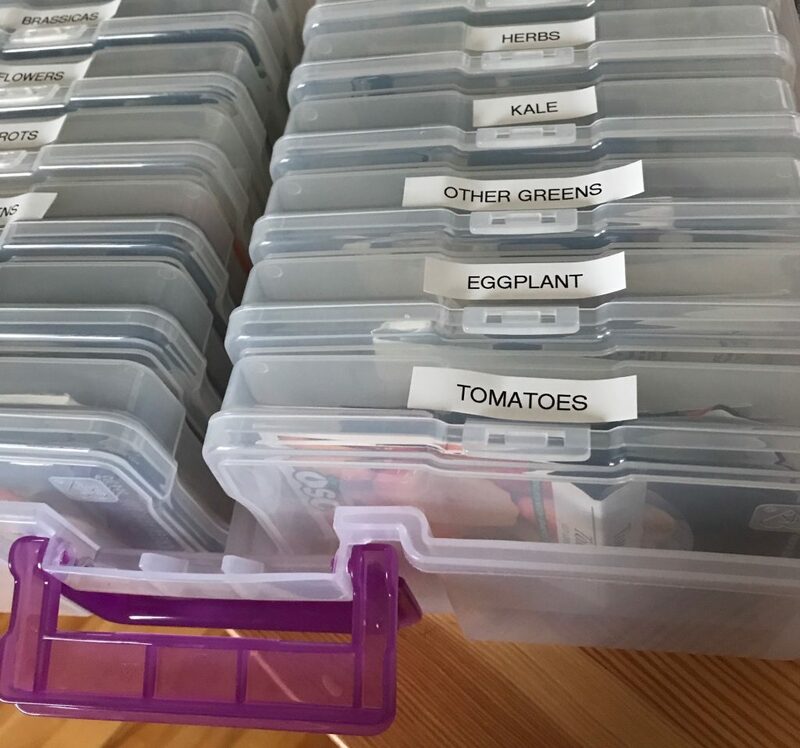 Deanna from Homestead and Chill had the brilliant idea of using a craft storage case to categorize and organize her seed packets. It keeps everything tidy, and I no longer have to worry about losing seed packets. You may have some trouble germinating old seeds if they haven’t been stored correctly and some seeds stay fresher longer than others. If you’re not sure if any of the seeds are viable? Germinate them before planting, so you can be sure you’re not planting duds. Place seeds on a damp paper towel and place inside a ziplock bag. Depending on the seeds in question, in a few days or so, you’ll have an idea as to whether the seeds are still good to go. I did this recently with a seed packet full of pepper seeds. I had no clue how old the packet was and didn’t want to waste tray space trying to germinate pepper seeds that would never grow, so I laid them out on a slightly wet paper towel to see what came up. Very few ended up germinating, likely from a combo of being very old and poor storage. What are your favorite ways to store seeds? Have you ever tried to pre-germinate seeds and did it help with your seed starting efforts? Dang, I had no idea you had to store them in an airtight container. I guess thats why one of the packets didn’t germinate at all. I got mine at the hardware store, and they had pretty much just thrown all the little paper packets together in a cardboard box.